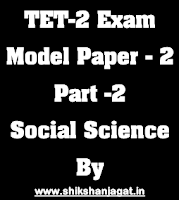 Today Here we are publishing First Paper of TET-2 Exam of Social Science. This Paper will help you a lot for TET-2 Exam Preparation. This Paper is created as per exam syllabus. We will publish daily a new paper for TET-2 exam. Candidates are requested to stay connected to us for More Study material and model papers. 0 Comments "TET-2 Exam Model Paper No.2(Social Science) By Shikshanjagat"